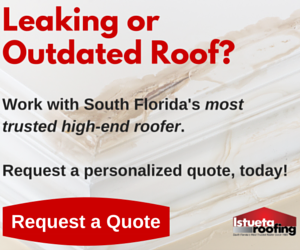 Istueta Roofing loves roofing Miami, but did you know we also roof Pinecrest? It’s one of our favorite neighborhoods to work in, and we work there as often as we can. Pinecrest is home to around 18,000 people, and was incorporated in 1996. Miami-Dade County is a pretty big place, but Pinecrest feels different than every other municipality in the area. That’s why we love it. We love Miami, but Pinecrest is a breath of fresh air. It’s an up and coming area with many new construction projects in the works. It’s also right on the water, so it’s a boater’s paradise. The trees and natural beauty are plentiful, too. But more than anything, Pinecrest is a great community full of amazing people and beautiful homes. We love working with Pinecrest homeowners– it’s a roofer’s dream come true. Since Pinecrest is located only 20 minutes from downtown Miami, it’s a popular area for some of Miami’s most refined residents. The South Florida Business Journal recognized Pinecrest as one of the top 10 cities in Florida for overall quality of life. With a strong economy, good educational system, high median household income, and an impressive level of higher education (67.04 percent of residents have completed at least a four year degree), it’s no wonder Pinecrest is doing so well. Pinecrest is a young city, though, so it’s only going to get better. You’ll see numerous construction projects throughout Pinecrest– many of which are new homes. In July, GC3 Development and Bindor Development announced the grand opening of their sales center for Pinecrest Place. Pinecrest Place will feature some amazing Coastal Contemporary style homes, which will only increase Pinecrest’s beauty. South Florida is beautiful in general, but few municipalities match Pinecrest for sheer natural beauty. The first thing most people notice when they come to Pinecrest is the abundance of trees. Well, the city has actually won an award for that. 10,000 trees in less than 20 years is impressive, and it shows in all of the city’s parks. You can play (or catch) a game of baseball at Evelyn Greer or Suniland Park, play some tennis at Coral Pine Park, or just soak in the natural beauty of Veterans Wayside Park. Pinecrest Gardens is also a go-to destination for art, tours, live music, or just basking in the glory of that South Florida sun. Because it’s so far east, many parts of Pinecrest are right on the water. Boating is a popular activity for Pinecrest residents, and even if you don’t have a boat, walking around the marina is an excellent activity in and of itself. Pinecrest is full of beautiful family homes. The landscaping itself is lush and radiant. They build them big in Pinecrest, but there aren’t many garish mansions that stick out like a sore thumb– every home is built with the community in mind. It’s also a family-friendly place. Outdoor recreation and activities are abundant, but it’s both safe and quiet. Pinecrest families have access to top public and private schools, as well as a state-of-the-art library. There’s plenty of shopping and fine dining to go around, too. The Pinecrest Community Center commonly hosts local events, and Pinecrest residents are deeply involved in their local government. The city also boasts free, outdoor wi-fi spots in key locations. Pinecrest Gardens, in association with the Green Market Co-Op, also hosts a farmers market every Sunday from 9am-2pm. You can find fresh produce and wares from local artisans, as well as classes on food production and food sustainability. Pinecrest really is a place where kids can learn, adults can flourish, and families can enjoy all the best parts of South Florida together. We’ll always love roofing Miami, but any time we get a chance to take a roofing job in Pinecrest, it’s a special treat.